Cheryl Lane is going under. Her marriage to William has broken down, she has moved in with a young boy half her age. To keep afloat she drinks, she shops and she takes pills. Would meeting up with William, something she has been avoiding like everything else in her life, give her what she needs anyway? In June, 2006, Picador launch Picador Shots, a new series of pocket-sized books priced at GBP1. The Shots aim to promote the short story as well as the work of some Picador's greatest authors. They will be contemporarily packaged but ultimately disposable books that are the ideal literary alternative to a magazine. Bret Easton Ellis' two short stories chronicle the lives of a group of Los Angele's residents all of them suffering from nothing less that death of the soul. Ellis has immense gift for dialogue, off-the-wall humour, merciless description and exotic bleakness. In 'Water from the Sun', Cheryl Lane is going under. Her marriage to William has broken down, she has moved in with a young boy half her age who is more interested in other young boys that in her and she keeps not turning up at work, the one area of her life that seems to be in good working order. To keep afloat she drinks, she shops and she takes pills. Would meeting up with William, something she has been avoiding like everything else in her life, give her what she needs anyway? 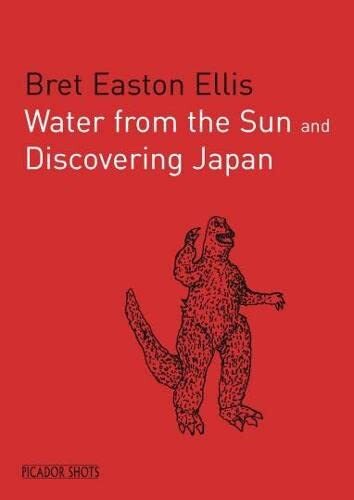 In 'Discovering Japan', Bryan, is on tour. His manager, Roger, has taken him to Tokyo to promote his record and do a few gigs. But to get Roger out of hotel room, off the drink, drugs and women is going to be a tall enough feet itself for Bryan. Written with spare and hypnotic prose, this is a story about a man hell-bent on distruction by a writer deeply concerned with the moral decline of our society.